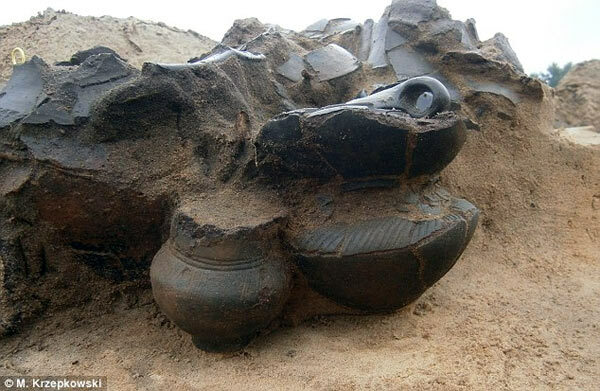 Archaeologists have discovered hundreds of pit tombs in the Polish village of Łęgowo near Wągrowiec, some of which contain tiny urns containing the cremated remains of babies dating back two-and-a-half millennia. Pit tombs were common during the Bronze Age and formed part of the Lusatian burial customs, which involved placing cremated remains in urns, which were understood as vessels that took the deceased on their ‘last journey’, and burying groups of urns together in pits. During the excavations, one pit was uncovered which contained as many as 40 urns. Sometimes ashes were offered as gifts to the gods, and the pits often contained clay gifts. In one grave, archaeologists found a tiny urn next to an early baby's rattle in the shape of a pillow made from clay and filled with small balls, in another they found a spoon with a handle shaped like a bird, while a third contained a decorated bowl with a small bird-like figure inside. Lusatian culture spread from Poland, into the Czech Republic and Slovakia as well as parts of East Germany during the Bronze Age and Iron Age. The people were believed to be mainly cattle, pig and goat farmers. Their practice of cremation is believed to be related to their ‘solar beliefs’ and worshipping of the sun. In total, the archaeologists found the remains of thousands of Lusatian settlers buried in 150 graves. Many of the urns that were uncovered were highly decorated with elaborate patterns and images that depicted the Lusatian way of life, including horse riding and agriculture. Families were usually buried together unless the pit tomb became full and was buried over, which means that the child graves were probably surrounded by the parents and other relatives of the child. Families would choose their tombs in a similar way to how funeral plots are allocated today.